“If decision-making is relegated to a knowledge that it is content to follow or to develop, then it is no more a responsible decision, [comma sic] it is the technical deployment of a cognitive apparatus, the simple mechanistic deployment of a theorum” (24). “[Abraham] keeps quiet in order to avoid the moral temptation which, under the pretext of calling him to responsibility, to self-justification, would make him lose his ultimate responsibility along with his singularity, make him lose his unjustifiable, secret, and absolute responsibility before God” (61). For the last few years I’ve relied on Derrida’s maxim “responsibility is excessive or it is not responsible” and on his contempt for the so-called “good conscience” (e.g., 85) without knowing the larger context of his critique of traditional responsibility. I’ve found it here. Derrida begins with commentary on Jan Patočka’s account of the rise of subjectivity and responsiblity in the Platonic turn from chthonic thaumaturgy and the subsequent turn, which moves from Platonic self-fashioning practices towards the Good into the Christian orientation towards the God absolutely beyond any subjective efforts. Christianity thus takes us beyond all calculation (50). Such turns, from the pre-Platonic, to the (neo)Platonic, to the Christian, are of course repressions, redeployments, rather than abandonments (e.g., 20). The subterranean is, of course, the gap, the uncognizable, the impossible, the place of the “authentic secret” (37), towards which any good deconstructive analysis always slides. Derrida follows with a gloss on Kierkegaard’s well-known treatment of Abraham as a ‘knight of faith’ to argue that the absolutes of duty and responsibility call “for a betrayal of everything that manifests itself within the order of universal generality” (66), call for acts that cannot be comprehended in “what the community can already hear or understand only too well” (74). In his conclusion, using Matthew 6:19-21, he turns to further analysis of the gift (e.g., “a gift destined for recognition would immediately annul itself” (29; also 112), of the sacrifice of economy (95), and the self-secret aporia at the heart of ethics. 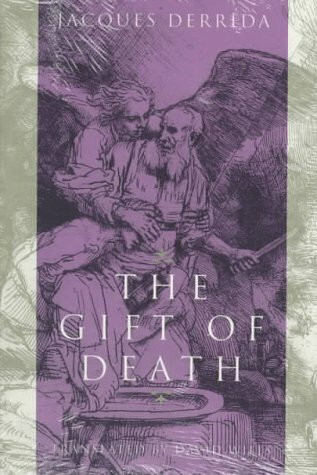 The ‘gift of death’ refers, inasmuch as I understand it currently, to death as the unsubstitutable experience of the self, that which no one but the self can undergo, that which cannot be shared; in this, death and responsibility are analogous. I wonder, however, if the analogy holds up, given the place of time in marking the thoughtwork of death in Heidegger (to whom Patočka seems deeply indebted), or, if it holds up, given the relation in making responsibility and the self possible in Lévinas. In other words, I wonder if responsibility as privacy, even through the paradox of responsibility, works as well as it seems to do on first glance. Undoubtedly I’ll need to reread this, but one answer might be in Derrida’s slogan tout autre est tout autre, of the sacrifices made–of animals, for example (69, 71; analogously, 86)–any time we are called into relation with one other (68-71). For a sillier treatment of this book, see here.